1. The cover: Personally, my thoughts were — pretty colors, but OMG PASSIVELY POSED GIRL IN A DRESS. If you like the cover, read the book. If you don't like the cover ... read the book. 2. The commitment: This is a BIG book. But it's a stand-alone, so huge thumbs up from me. And the scope is epic, so I think the length is warranted. 3. The lingo: Especially in the first pages, it's a little tough to get used to the jargon in the dialogue that's specific to Ava's world. It'll start making sense soon; just keep going! I love novels in which the main character goes through a major transition. In the beginning of SALVAGE, Ava has never left the confines of the merchant ship Parastrata and its male-dominated polygamist society. She's a haughty girl with a position of respect, and she doesn't know that she should want more from life than physical labor and becoming one of a man's many wives whose main function is to make babies. But her desire for knowledge to learn "fixes" (mechanical skills to fix machinery) hints at the person she could be. 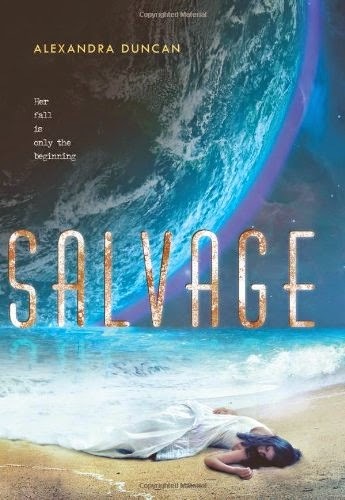 Then Ava makes an impulsive, naive decision ... which is also an epic mistake in her unforgiving society, and to escape death, she flees to Earth — a post-climate-change planet of storms and garbage. She barely survives adjusting to the forces of gravity, and then she must survive the unknown. Here, her world is expanded. First in Gyre (as the book description says, it's a floating continent of garbage and scrap in the Pacific Ocean), and later in Mumbai, Ava is confronted with a world that doesn't limit her potential, so she has to renegotiate who she is and who she imagines herself becoming. It's the ultimate culture shock, as she discovers how ignorant she was kept on Parastrata. The supporting characters are so richly imagined, complex, and diverse — but I'm afraid I'll spoil some things if I describe them. But they were all imperfect and multi-dimensional, and I loved how their relationships with Ava develop. One example is Miyole, a young girl Ava meets. In many ways, Ava is a mother or older sister figure for Miyole, literally ensuring her survival, but Miyole is self-educated and extremely intelligent, so she's teaching Ava reading and math. And Ava has these moments where she's incredibly proud of Miyole, but she can't help but be jealous of how much Miyole knows and how easily learning comes to her. Such a beautiful, complicated relationship! The romance question — yes, a romance does develop, but no, there's no love triangle, because interest in two people does NOT a love triangle make! Interest in two people is totally normal, and in SALVAGE it works wonderfully, because one represents the best of the world she left, and one represents the new world she's come to know ... and neither overwhelm the story. Going into the book, I had no idea if it was the beginning of a series, and as I approached the ending, I almost starting cringing inside, because I saw two paths emerge — one that would lead to a cliffhanger and sequel, and one that would lead to the end of Ava's story. I was so, so happy that Duncan chose to keep this a stand-alone, but I'd be very happy to read companion novels with different characters in the same world, because there's so much potential for this world! And I'm going to throw a FIREFLY comparison in here, since I haven't seen one yet — between the unusual jargon, diverse societies both on planet and in space (with a dystopian blend of the past and future), and merchant spaceships, I definitely felt a hint or two of the FIREFLY world.